1. Preheat the oven to 200°C, gas mark 6. Place the spinach in a large bowl and pour over a kettleful of boiling water. Leave for a minute or two until wilted then drain very well. 2. Transfer to a food processor and whizz until very finely chopped. Add the ricotta and two tablespoons of the Parmigano Reggiano and whizz again – mix in a splash of semi-skimmed milk or water if the sauce seems a bit thick. 3. Cook the broccoli in a large pan of boiling water for 1 minute, add the gnocchi and cook for a further for 2 minutes then drain well. 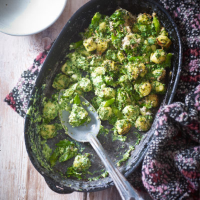 Return to the pan, add the spinach mixture, lemon zest and basil and toss well together to coat the gnocchi. 4. Tip the gnocchi into a heatproof dish. Scatter over the breadcrumbs, remaining Parmigano Reggiano and a good grind of black pepper. Bake for 15 minutes until golden. For a pasta bake, try this with 500g pack wholewheat penne in place of the gnocchi. The textures and flavours here are perfect for this Italian blend of Fiano, Falanghina and Greco: Triade 2010 IGT Campania, Italy. This recipe was first published in February 2012.